A revolutionary Anti-Ageing treatment that is clinically proven to reduce skin crpiness and increase skin firmness. 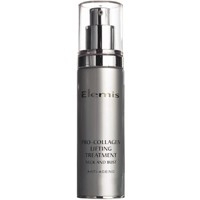 A powerful Elemis solution for slackening skin, minimising the signs of ageing for a smoother, firmer, more youthful-looking neck and bust. Water (Aqua), Glycerin, PEG-8, Helianthus Annuus (Sunflower) Seed Oil, Propylene Glycol, Butyrospermum Parkii (Shea butter), Pentylene Glycol, Vegetable Oil (Olus), Beeswax (Cera alba), Copernicia Cerifera (Cera carnauba) Wax, Macadamia Ternifolia Seed Oil, Simmondsia Chinensis (Jojoba) Seed Oil, Padina Pavonica Thallus Extract, Chondrus Crispus (Carrageenan), Milk Protein (Lactis proteinum), Chlorella Vulgaris Extract, Hippophae Rhamnoides Oil, Propolis Wax (Propolis cera), Royal Jelly Extract, Cistus Monspeliensis Extract, Crithmum Maritimum Extract, Carbomer, Lauryl Glucoside, Polyglyceryl-2 Dipolyhydroxystearate, Tromethamine, Fragrance (Parfum), Ammonium Acryloyldimethyltaurate/VP Copolymer, Caramel, Disodium EDTA, Glyceryl Acrylate/Acrylic Acid Copolymer, PEG-40 Hydrogenated Castor Oil, Phenoxyethanol, Chlorphenesin, Tocopherol, Methylparaben, Butylparaben, Ethylparaben, Propylparaben, Isobutylparaben, Alpha-Isomethyl Ionone, Butylphenyl Methylpropional, Amyl Cinnamal, Citronellol, Limonene, Cinnamyl Alcohol, Linalool, Geraniol, Hydroxycitronellal. Perhaps suited to 50+ age range. Left skin sticky and coated. Packaging and ease of use. Very expensive. Was not absorbed easily. Skin felt sticky and coated. This skin has had very good results in trials, where creping had been seen to be reduced. Perhaps this product is better for someone 50+, but for a 40-something it was unpleasant to use, and gave little result. "Perhaps suited to 50+ age range. Left skin sticky and coated."